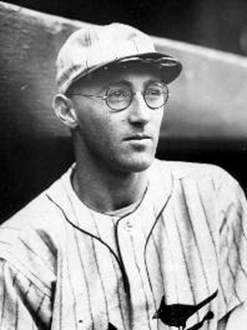 Chick Hafey was one of the first position players in the major leagues to wear eyeglasses. Problems with his eyesight did not prevent him from winning a National League batting title and being elected to the Baseball Hall of Fame. Hafey broke into the major leagues with the St. Louis Cardinals in 1924, and most accounts say he began using glasses in 1929. That followed about three years of problems with his eyesight that began in 1926. Problems notwithstanding, he hit over .300 in seven straight seasons (1927-33), both before and after he donned eyeglasses. Born on February 12, 1903, in Berkeley, California (for years he claimed 1904 to present himself as younger), Charles James Hafey was one of eight children, the son of James Hafey, a laborer born in Ireland, and Annie Hafey.1 The family was sports-minded. An older brother, Albert, pitched in 1913 for Portland of the Pacific Coast League; later, two cousins, Bud and Tom, played in the majors. Chick was first attracted to football, often playing halfback. Chick’s interest eventually shifted to baseball, which he hoped to break into as a pitcher following his older brother’s path. Joining the Shattuck Avenue Merchants, a local winter team, Hafey caught the attention of a friend of St. Louis Cardinals general manager Branch Rickey, who asked a part-time Cardinals scout, a professor at the University of California named Charles Chapman, to check out Hafey. On Chapman’s recommendation, the Cardinals signed Hafey as a pitcher in time for him to report to the Fort Smith Twins in the Class C Western Association for the 1923 season. Before reporting, Hafey married Bernice Stigaliano of Berkeley on December 1, 1922. A grandson by marriage, Jack Lestrange, said they might have become acquainted by having grown up together in Berkeley.2 Chick and Bernice were married for 50 years and had a son, Charles James, born on August 31, 1923. Charles Jr., also known as Chick, eventually followed his father into farming and ranching. Although Chick Hafey was signed as a pitcher by the Cardinals, he never made it to the mound in a professional game. During his first spring training, at Bradenton, Florida, Hafey came under the watchful eye of Rickey while taking batting practice. As later recounted by Arthur Daley in the New York Times, Rickey watched Hafey launch several balls into a grove of trees deep in left field, and exclaimed, “By Judas Priest — who is that boy?” When told Hafey was a pitcher, Rickey decreed, “You mean he was a pitcher, from now on he is an outfielder.” 3 And so he was. Hafey proceeded to hit a solid .284 for Fort Smith with 14 triples and a team-leading 16 home runs. Promoted to the Houston Buffaloes in the Texas League the next year, Hafey hit a resounding .360, earning him advancement to the Cardinals late in the season. Hafey made his major-league debut in a doubleheader against the Chicago Cubs on August 28, 1924. Facing veteran Vic Aldridge in the first game, Hafey went 0-for-4 as St. Louis lost, 5-2. He got his first major-league hit, a single, in the second game hit as the Cardinals lost, 8-3. Two days later, on August 30, he cracked his first major-league home run, a solo shot off fellow rookie Guy Bush of the Chicago Cubs. He also recorded his first major-league assist in the game. Hafey’s career usually centers on how well he hit — for consistency and with power. While hitting was a key part of his game, Hafey was considered a possessor of one of the most powerful arms in baseball. The box score for the August 30 game crediting Hafey with an assist also shows he took part in a double play. A runner tried to move up a base against a man who was originally signed as a pitcher. His ability to throw a baseball took on different dimensions within the game than originally anticipated. Hafey’s ability to throw would be compared favorably with later-day talents like Roberto Clemente and Carl Furillo. After his call-up Hafey hit .253 in 24 games as St. Louis finished a weak sixth. He showed power and the ability to drive in runs. Hafey made enough of an impression to begin the 1925 season with the Cardinals. By the end of June he was not hitting well — .219 on June 20, when he was farmed out to Syracuse in the International League. A month later fortune smiled on him as Cardinals outfielder Ray Blades suffered a leg injury Hafey was called up to replace him. Hafey never played in the minors again. In his first game back he went 4-for-5, and for the remainder of the season he hit well, finishing with a season average of .302. Until 1926 the Cardinals had never won a pennant, but that omission was rectified as they took the title by two games over the Cincinnati Reds. Hafey posted a creditable season, hitting .271, but with Ray Blades, Taylor Douthit, and Billy Southworth all hitting over .300, he was able to get into only 78 games. By the end of the season, with Blades out of the lineup with a knee injury, Hafey became the regular left fielder. In the World Series against the New York Yankees Hafey hit a disappointing .185. However, in the seventh game, made famous by Grover Cleveland Alexander’s strikeout of Tony Lazzeri, Hafey’s single in the fourth helped the Cardinals to score the three runs that stood up for a Series-winning 3-2 victory. Other possible explanations for Hafey’s physical problems surfaced over the years. One was that at the beginning of the 1926 season a badly infected tooth affected the eyesight of his left eye.6 Another version, also pegged at the beginning of the 1926 season had his problems starting after being hit by pitches. Sportswriter Bob Broeg wrote shortly after Hafey died in 1973 that Hafey had been hit by pitches twice in a game in 1926,7 but this appears not to be true. Retrosheet.org notes only that Hafey was hit by a pitch twice that season, once on April 13 and once on April 18. Most accounts date Hafey’s use of eyeglasses to the beginning of the 1929 season. While a player with glasses is not uncommon today, it was a major story in the late 1920s. Just a few years before, George Toporcer, a Cardinals utility infielder, had made baseball history by becoming the first major-league position player to use glasses. Hafey was one of the first regulars, if not the first, to don spectacles for a game. Over the years his preparation for the game grew more sophisticated. He used separate pairs of glasses for hitting and fielding as well as a “patent lambs wool filter” in his nose to ward off sinus infections. Hafey missed nearly a third of the 1927 season because of his various ailments. Still, in 103 games, he batted.329 and led the National League in slugging (.590) as St. Louis fell back to second place, a game and a half behind Pittsburgh. It was the first of the seven straight seasons in which Hafey batted over .300. The next four years Hafey was at the peak of his career as the Cardinals won pennants in 1928, 1930, and 1931. Three years in a row Hafey hit over .330 with 26 or more homers and 100-plus runs batted in. He was never in better form than in early July 1929, when he set a major league record (since broken) by rapping out ten consecutive hits. That his hitting was held in awe by opposing players is illustrated by a story, perhaps apocryphal, concerning Fresco Thompson, who played third for the Brooklyn Dodgers at the time. Hafey had signed a contract in 1928 for $7,000. In 1929 he got a raise to $8,000, and in 1930 to $9,000. Since he had done exceptionally well during those three seasons, he felt he deserved a substantial raise going into 1931 and asked for $15,000. Years later, Branch Rickey often mentioned how great a player Hafey was. “I always thought that if Hafey had been blessed with normal eyesight and good health, he might have been the best right-handed hitter baseball had ever known,” Rickey said. He also was highly complimentary of Hafey’s arm; he often described rifle-armed prospects by saying, “He could be another Chick Hafey.” But this latter-day adulation was not in evidence as the 1931 season began. He turned down Hafey’s request for $15,000, offering him a raise to $10,000. This offer was made after three seasons in which he batted .337, .338, and .336, and the Cardinals won two pennants. Rickey called Hafey’s request “outrageous” at a time the country was in the middle of the Depression. While that was true, it was also true that Rickey was extremely stingy when dealing with players, using every reason, legitimate or not, to hold their salaries down. After a protracted holdout, Hafey agreed to a contract for $12,500. By then the season had started. Rickey decreed that Hafey was not in shape to play and docked his pay $100 a day until Hafey was ready to play. It took 21 days for the Cardinals to determine that he was ready to play — and he lost $2,100. There was nothing Hafey could do about it short of quitting. When he got back into action Hafey took up his hitting where he had left off the previous season. By the end of August the Cardinals were well ahead of the Giants and Hafey, at .329, was among the league leaders in batting average. For the remainder of the season Hafey hit at a .435 pace. On September 19, he took the batting lead from Bill Terry. Terry had several good days and drew closer to Hafey. Against the Chicago Cubs on September 20, Terry had three hits in three at-bats before he “craftily called it a day” as John Drebinger of the New York Times put it, the implication being that he came out of the game to protect his average.11 Terry was then handicapped by the quirks of the schedule, which called for five straight days off during the final week of the campaign, with a doubleheader scheduled on Sunday, September 27, the last day of the season. Hafey’s season ended first. He played in a doubleheader against the Reds going 2-for-8 and finishing at .349. Terry went 1-for-4 in the first game of the doubleheader against the Brooklyn Dodgers and singled in his first at-bat in the second game, raising his average to.350. Knowing he was ahead of Hafey, Terry came out of the lineup to protect his lead. Unfortunately for Terry, the baseball gods intervened. After 3½ innings the second game was suspended because of a cloud cover over the field. Waiting for the weather to clear, the umpires failed to account for a restless crowd, which swarmed onto the field and forced them to call the game.12 The records for the second game were erased, Terry’s single with it. Both Terry and Hafey finished at .349. Carrying the numbers out an extra decimal place, Hafey’s average stood at .3489, Terry’s at .3486. There was some sentiment that Terry should share in the title because he had played in all but the last (canceled) game, while Hafey missed 32 games. National League President John A. Heydler ruled that Hafey had the higher average and was the champion. Overlooked in the matter was Jim Bottomley, Hafey’s roommate, who had finished at .3481. If Bottomley had made one more hit he could have won the title. Whether Heydler would have disallowed Bottomley because he appeared in even fewer games than Hafey (108 with 382 at bats) is a question that will never be answered. The World Series between the Cardinals and Athletics featured the two major-league batting champions for only the second time. The A’s Al Simmons had won the title in the American League. The 1909 batting champions, Ty Cobb and Honus Wagner, faced each other in 1909. It happened a third time in 1954, when Cleveland’s Bobby Avila and the New York Giants’ Willie Mays opposed each other in the World Series. When Hafey had not signed by Opening Day he was traded to the Cincinnati Reds for pitcher Benny Frey, infielder-outfielder Harvey Hendrick, and cash. Hafey pronounced himself satisfied with the trade; he would receive a contract for $15,000. The Cardinals had rid themselves of what they perceived as a recalcitrant employee and were comforted by the fact that waiting in the wings to supplant Hafey for the Cardinals offense were first baseman Ripper Collins and a soon-to-be-called-up Joe Medwick. Hafey joined a club that perpetually languished in or near last place. In 1932 he followed up his league-leading average with a mark of .344, though he played in barely half the games. He was late reporting because of his contract dispute and later in the season lost more than a month during a bout with influenza. The Reds finished last. While Hafey hit well the next few years, his career had peaked; his average hovered around the .300 mark; home runs dwindled to just seven and 18 in 1933 and 1934. Despite this he was still recognized as one of the better players in the game. Cincinnati continued to finish last. In 1933 the first All-Star Game was played in Chicago as part of the World’s Fair. Players were picked by the managers and fans. Hafey was selected for the National League team and batted cleanup. His single in the second was the first hit in All-Star Game history. The aging Babe Ruth, chosen for the American League team less for his season statistics than for his reputation, highlighted the game with a home run, and with a runner on base in the eighth inning speared Hafey’s line drive that was headed into the stands. Hafey’s ailments subsided for a time. In 1933 and 1934 he appeared in more games than at any other time during his career, although he left the team several days before the 1934 season ended to have an operation on his sinuses. He was 31 years old in 1934 and indicated an interest in retiring from baseball to stay home with his family. He bought property in Walnut Creek, California, thinking of retiring there. But it was a passing sentiment, as he reported to the Reds for the 1935 season. In 1935 Hafey started off well and was hitting .339 in early May when he was stricken with the flu in Philadelphia. Ill for several weeks, he recovered and rejoined the team only to suffer a relapse. Continuing to feel ill, leery of entering a hospital so far from home, and most likely depressed, Hafey and Bernice decided it was best for him to go back California, where he hoped to regain his health. He did not play the remainder of 1935 or all of 1936. Hafey came back in 1937 but it was not satisfying. In and out of the Reds’ lineup, he played in only 89 games and hit .261 with no power. By the middle of September he was just pinch-hitting. He singled to drive in a run against the Cubs on September 27; three days later he unsuccessfully pinch-hit for shortstop Billy Myers. It was his last appearance in a major-league game. Hafey retired with a lifetime batting average of .317, 164 home runs, a batting title, two World Series championships and having played on four pennant winners. He purchased farmland near Calistoga, which is today prime property in the heart of Northern California’s wine country. He eventually ended up buying 1,200 acres for $10,000 and raising cattle and sheep. Lestrange recalled that Hafey’s wife, Bernice, did not so much balk at the purchase price as she did at the $500 commission paid to the real-estate agent. Hafey proved quite handy; he built his own milling equipment and used it to build a barn on the property. Over the years several of Hafey’s contemporaries and teammates were elected to the Hall of Fame: Frankie Frisch in 1947, Medwick in 1968; other outfielders such as Heinie Manush, Goose Goslin, Lloyd Waner, and Kiki Cuyler from Hafey’s era were elected. In the late 1960s sportswriter Bob Broeg of the St. Louis Post-Dispatch began writing articles complimentary of Hafey and suggesting that he be elected to the Hall. Hafey had drawbacks. Because of his illnesses he played in 100 or more games only seven seasons during his 13-year career. And he hit.205 in his four World Series appearances. Late in life Hafey took up golf. He told friends, “I took up golf two months ago but too many years too late I am hitting to right field!” 16 It was about this time that Jack Lestrange married Chick’s granddaughter Sarah Lee. It was well into his courtship of Sarah that Jack realized her grandfather had “once” played professional ball. He recalled Chick as a very quiet, retiring, and gracious individual. Chick’s health began to fail; he had a stroke in the late 1960s and suffered from attacks of asthma and stomach problems. In February 1971 Hafey received a phone call from Giles. Giles recalled, “The last time I spoke to Chick he turned down the salary I offered him.” Giles was no longer general manager of the Reds; he was chairman of the Hall of Fame Veterans Committee, and he had called Hafey to inform him he had been elected to the Hall of Fame. Giles noted that Hafey got quite a chuckle out of who called and the purpose of the call. The Veterans Committee decided, in a manner somewhat similar to that in selecting Sandy Koufax, to look at the brilliance of a career rather than hold back selection from someone whose achievements were limited by health issues. Hafey was elected to the Hall that year along with Dave Bancroft, Jake Beckley, Joe Kelley, Rube Marquard, and Harry Hooper. Subsequently, many of the selections made by the Veterans Committee, especially during this era, were seen as acts of cronyism, that honorees owed their selection to having been teammates of committee members like Frankie Frisch and Bill Terry rather than being based on merit. Controversy over admission of players chosen in this manner, including Hafey, continues to this day.17 What gets lost in the continuing dialogue on this matter, at least with respect to Hafey, is that for several years he was one of the most respected players in the National League. He played on a par with the likes of Hornsby, Terry, and Waner — and that is what ought to be remembered. Hafey kept his promise and came back in 1972. Several months later, in December, he and Bernice celebrated their 50th wedding anniversary. He was planning to come to a reunion of the 1933 National League All-Star Team, but that was not to be as he died on July 2, 1973. In keeping with his quiet persona, Hafey’s funeral was private; it was not until a few days later that the public at large became aware that one who had achieved much in his baseball career was no more. 1 Information about the Hafey family developed by Barbara Erion. Additional information about the Hafey family contained in the Baseball Hall of Fame file on Hafey. Unless otherwise noted, all other materials are from the Hall of Fame file, most of which is undated and lacking identifying publisher. 2 Interview with Jack Lestrange, May 10, 2011. 3 New York Times, February 2, 1971. 4 The Sporting News, April 7, 1927, 1. 6 July 1973 article from Hall of Fame file. 7 St. Louis Post-Dispatch, July 8, 1973. 8 Retrosheet.org is the source for all statistical data in thios article. 9 The Sporting News, November 18, 1978, 35. 10 Leonard Gettelson, World Series Records. St. Louis: The Sporting News, 1977. 397. 11 Peter Williams, When the Giants Were Giants; Bill Terry and the Golden Age of New York Baseball. Chapel Hill, North Carolina: Algonquin Books, 1994. 111-112. 12 Thom, John, Champion Batsmen of the 20th Century. Los Angeles: Bat & Ball Press, 1983. 44. 13 St. Louis Post-Dispatch, July 8, 1973. 14 San Francisco Examiner, April 29, 1966. 17 Zev Chafets, Cooperstown Confidential: Heros, Rogues, and the Inside Story of the Baseball Hall of Fame.New York: Bloomsbury, 2009, 42-43; and Bill James, The New Bill James Historical Baseball Abstract, New York: The Free Press, 2001, 455-456 each take the Veterans Committee to task for their selections.